Dislcosure: I was provided the Vitabath In Bloom Asian Orchid and Coconut collection to facilitate this review. With spring just around the corner, Vitabath's In Bloom Asian Orchid and Coconut collection is the perfect treat, especially after this cold, drying winter. The collection is lightly scented with orchid petals with hints of coconut and pink sugar. When I say hints, I do mean hints of coconut--trust me, it doesn't have a beachy coconut suntan oil smell, but truly a light, refreshing scent. The collection features a bubbly body wash that is Sulfate and Paraben free. Your skin will feel refreshed and clean after using this. It is formulated with an antioxidant super fruit blend of Acai, Goji, Coffee, Noni, Pmegranate, Mangosteen and Green Tea and fortified with Vitamins A, B3, C E and Pro-Viatmin B5 skin conditioners. 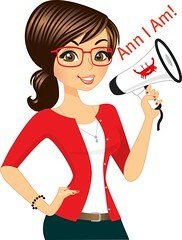 It does not contain Petro-Chemicals or Triclosan and is free of propylene glycol, DEA, TEA, silicone and mineral oils. This is definitely something you can feel good about using on your skin. Also included in the collection is a Body Mist. I love the body mist to just spray on to feel refreshed throughout the day. It also contains the super fruit blend and vitamins that the body was contains. The item I like best in the collection is the Hydrating Body Lotion. This great lotion is formulated with Aloe Vera, Safflower and Olive Oils and leaves your skin silky and smooth. Once again, it is free from parabens, propylene glycol, phthalates, sulfates, mineral oil, and synthetic color. It leaves your skin feeling healthy, with just a hint of fragrance. 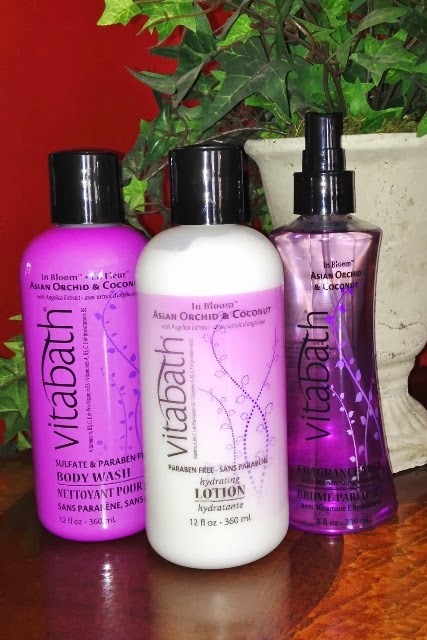 I really love that all of Vitabath's Fragrance Collection formulas are Paraben and Sulfate free. Who needs that for their skin? With this collection, I really love just the hint of fragrance and how fresh it smells. This collection would make a great gift or a special treat for yourself. Right now, if you purchase the bundle, you can get significant savings at Vitabath.com. Or maybe you want to try to win the Vitabath In Bloom Asian Orchid and Coconut collection for yourself. Just enter the easy giveaway below. Dislcosure: I was provided the Vitabath In Bloom Asian Orchid and Coconut collection to facilitate this review. Vitabath will provide the winner with the prize. I relax by taking long hot baths, while watching a movie. :) Thanks for the giveaway! I like to relax with a mug of hot tea and play facebook games. Would like to try the In Bloom Beach Blossom Hydrating Body Lotion. I like to eat chocolate to relax or taking a hot bubble bath. I go for long walks to relax. I like to relax by laying quietly and inhaling the sweet scents of lit candles. I'd like to try the Sweet Vanilla Amber Body Wash & Lotion Set. In the evening I like to light candles, turn off the lights and soak in a hot bath tub. I like to make myself a fancy coffee or a glass of wine & watch documentaries. I like to relax in a long hot bath with a book and a glass of wine! I take a bubble bath to relax. In Bloom™ Asian Orchid & Coconut Body Mist. I love to take walks or just read. I need quiet time and both those allow me to achieve it. candles, bubblebath and a glass of wine. If the chance comes up, I like to lay on the couch and read a book.